2017 Kansas City NARI Remodeled Homes Tour! Although it was cold and rainy the weekend of the Kansas City NARI Remodeled Homes Tour, our remodel was warm and charming! Our clients' home was longing for updates that supported the continuity of the 1909 era in which it was built! Crown molding was added and lighting was designed to spotlight the home's artistic flair. Every detail of the custom doorway that opens up to the dining area on the left was researched until the perfect items were found to match the original that leads to the kitchen on the right. A much better fit than the small arched doorway that was once there! Constructive Ideas', Mark Bovas designed and built the beautiful cabinets that serve as a buffet and provide storage for formal dinning wares. Developing relationships with clients is what Terry Skilling and our entire staff love about the remodeling industry. Lead Carpenter Michael demonstrates how this fireplace's features can set the mood for the space. 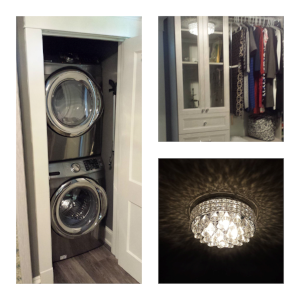 We combined talents with California Closets - Kansas City and Canaan Stone Works to transform a utility laundry room into a beautifully elegant walk-in closet! Learn more about our partners' contributions here! Our painting crew added depth to this attic space with a bright apple red floor while fresh white walls and ceilings make the space stand tall! Mini Split units are the perfect solution for ultimate comfort in small spaces. Thanks to our partners at All Current Electric for their outstanding electrical work throughout the remodel. 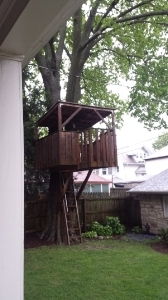 As we wrapped up the project, we can't help but wonder if there is a renovation project in this tree house's future! We hope so because we loved working with these clients!